Record rainfalls and record droughts during 2018 have had a major effect on the world of irrigation in France. There were difficulties in adapting the supply chain and planning the responses. The industry found itself having to switch from nothing at all happening in the spring to suddenly being overwhelmed the following week. 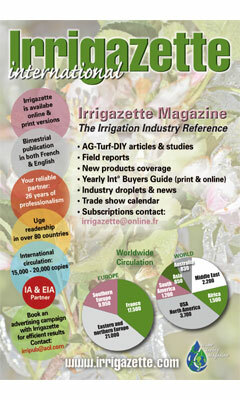 Irrigation is essen­tial and we need to understand that we as an industry provide a service. The Synaa (French Automatic Irrigation Trade Association) conference will take place in Aix en Provence on 22nd and 23rd November 2018. Apart from the statutory general assembly, we have placed an emphasis this year on the personal enrichment and empower­ment of everybody with the partici­pation of the players and stakeholders who will be addressing our everyday concerns. Management of the person­nel and stress in the work place will also be on the agenda. Set in the heart of the vineyards of Provence, it offers everyone a chance to share information and enjoy these moments of conviviality in the usual manner. We wish everyone a good end to the summer.